This piece discusses the topic of self-harm. Please use your discretion. In my hands, I hold the suicide note I wrote “just in case” I decided to take my life. It’s flooded with sentences like, “I hate myself” and “I am so sorry you had me in your life” and “I do not deserve to be here.” Sentences I have screamed at the top of my lungs over and over while banging my fists on the steering wheel of my car. Sentences that have echoed in my mind day in and day out, at work, at school, at home. Sentences that have convinced me to self-harm time and time again. The thought to get rid of the note comes, but I am afraid to part from it. What if I choose to live and the world suffers from my existence? I decide to get rid of it anyways. I tear the note apart and lay the pieces on my bed. I consider throwing them away, but this doesn’t feel finite enough. No, I’ll use the fireplace instead. The next day I open the fire grate and begin to throw the paper onto the fire, a few shreds at a time. In defiance of the lies, I say out loud, “I do NOT hate myself. I am NOT sorry for existing. I DO deserve to be here.” I watch the papers expecting them to erupt in flames, but they don’t. Rather, they remain intact. Frustrated, I look closer. The writing on the paper is beginning to fade, but the pieces of paper themselves are becoming smooth, blank canvases. As the writing disappears, the many pieces begin to melt together into one cohesive unit. The lies I believed for so long are erased from the canvas that is my life. My life, full of all its memories and experiences, remains, but is no longer tainted by the lies I believed for so long. I stand in awe of a God who has wiped my slate clean and delivered me from the weight of these lies. I stand in awe of a God who takes the broken pieces of my life and melts them together into an entirely new, beautiful, creation. Although I’d like to tell you that it was all uphill from there, it wasn’t. It was a little bit of downhill, then a whole lot of uphill. Then a slightly longer stretch of downhill, and a slightly shorter stretch of uphill, and so on and so forth. But throughout those stretches, it was, above all else, a matter of choosing to live time and time again. It was a matter of telling myself, “I want to live,” even when all I wanted to do was die. Of telling myself, “I want to live,” even when I was convinced the world would be better off without me. Of telling myself, “I want to live,” even when I felt crushed by the weight of the immense guilt I carried for the very act of existing. Over time, I started going for runs around my neighborhood and noticed that things were starting to feel different. The earth was brighter, the flowers more fragrant, the song of the birds, more beautiful. I went to the beach with friends and enjoyed the sensation of the breeze on my face and the feel of my feet sinking into the sand. I began spending hours worshipping and writing songs at my piano. The hard days remained, sometimes for weeks and even months, but one step at a time, I walked out of the darkness that I called home for so long, and into the light of the sun. And then a day came where, for the first time, I said, “I want to live,” and I truly meant it. You too have permission to choose life. You are worthy of pink sunsets and fields of flowers and a cup of tea in the morning. 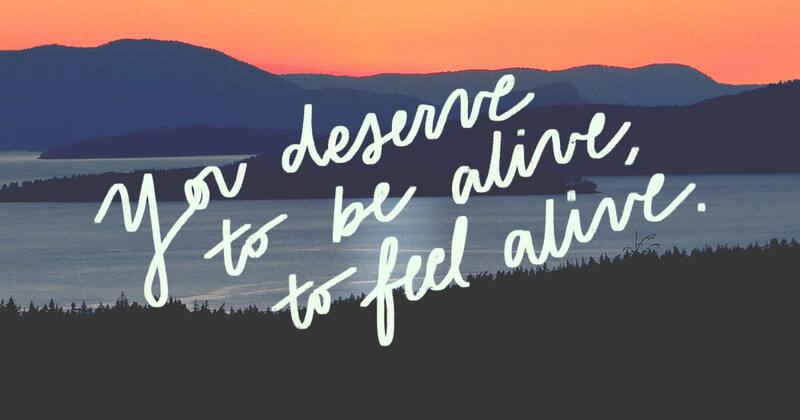 You deserve to be alive, to feel alive. Choose life. And as you do, you will find sunshine. You will be able to say, perhaps for the very first time in your life, “I want to live,” and mean it.